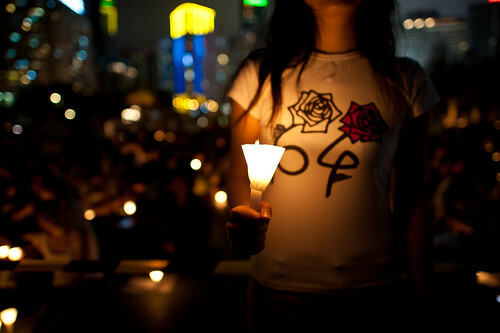 Tiananmen Square vigil in Hong Kong. Photos by dawvon. Last night, as Chinese internet censors frantically banned words like “today” and “Tiananmen” from web searches and social media, 180,000 people gathered in Hong Kong to commemorate the 23rd anniversary of the June 4th massacre. This is an annual ritual that has taken place ever since the first tanks rolled down Chang’an Avenue in Beijing. Its attendance has waxed and waned over the past two decades, but ever since the 20th anniversary of the massacre in 2009, a new generation of young Hongkongers, joined by a growing number of visitors from mainland China, have re-energized the vigil. This year, more people made their way to Victoria Park than ever before. For many people in Hong Kong, the slaying of student demonstrators in Beijing destroyed any confidence they once had in China. It’s no coincidence that, in the five years following 1989, hundreds of thousands of people emigrated to places like Canada and Australia, seeking insurance against the city’s impending transfer of sovereignty from Britain to China. Before 1997, people actually spoke with some seriousness about People’s Liberation Army tanks rolling down Queen’s Road. Reality turned out to be more benign. China’s economic boom and relatively hands-off approach to Hong Kong restored confidence in the mainland. With the exception of 2003, when opposition to proposed national security legislation led to a surge of attendance at the vigil, the memory of Tiananmen seemed to be growing less relevant by the year. By 2008, the year of the Beijing Olympics, Hong Kong seemed to be more committed to China than ever before. Things changed the following year. A combination of factors — the massacre’s 20th anniversary, discontent with local leaders, a growing anxiety that Hong Kong’s essential freedoms are under threat — has transformed June 4th into a day of generalised opposition to Chinese authoritarianism. Even more striking is the way it has become an emblem of Hong Kong’s civil society. When you consider the ongoing suppression of dissent in China — the June 4th anniversary was preceded in Beijing by an annual police roundup of potential troublemakers — it’s pretty remarkable that tens of thousands of people gather each year in Hong Kong, without violence or intimidation, to light candles and call for justice and freedom. For all the frustrations of Hong Kong life, for all the obstacles to universal suffrage and a truly representative government, this is democracy in its purest form. Below, photos by dawvon of last night’s vigil. This entry was written by Christopher DeWolf , posted on Tuesday June 05 2012at 11:06 am , filed under Asia Pacific, History, Politics, Public Space, Society and Culture and tagged Hong Kong, Parks, Protest . Bookmark the permalink . Post a comment below or leave a trackback: Trackback URL.